Almost all of us have been to a pharmacy before to pick up a prescription. Whether it’s a prescription for ourselves, a family member or a friend, we’ve had to wait our turn in the pharmacy line. What’s the wait all about anyways? Can’t the pharmacy just fill our plastic, orange bottle so we can be on our way? What are they really doing back there? Most of us believe we have a very good idea about what a pharmacist does in his or her average day. While waiting for our turn in line to arrive, we watch the pharmacist behind the counter checking and counting prescriptions, commonly referred to in the pharmacy world as dispensing. The truth is, we’d be surprised to discover that dispensing is only a portion of what a pharmacist is able to do. Pharmacists are trained in clinical pharmacy and medication therapy management and can have specialties similar to doctors and other healthcare providers. Some of these specialties include: ambulatory care, emergency medicine, infectious diseases, oncology, pediatrics and more (ACCP). So, what is clinical pharmacy? Clinical pharmacy is a part of pharmacy that focuses less on preparing and dispensing medications, and more on optimizing the use of medications. These pharmacists work directly with physicians, other health professionals and patients to ensure that the medications patients are being prescribed contribute to the best possible health outcomes. Clinical pharmacists work in health care settings where they have frequent and regular interactions with physicians and other health professionals, contributing to better coordination of care (ACCP). Refers the patient to his or her physician or other health professionals to address specific health, wellness or social services concerns as they arise. In essence, clinical pharmacy is all about serving the patient and making sure that the patient is on the most appropriate, effective and safe medication. 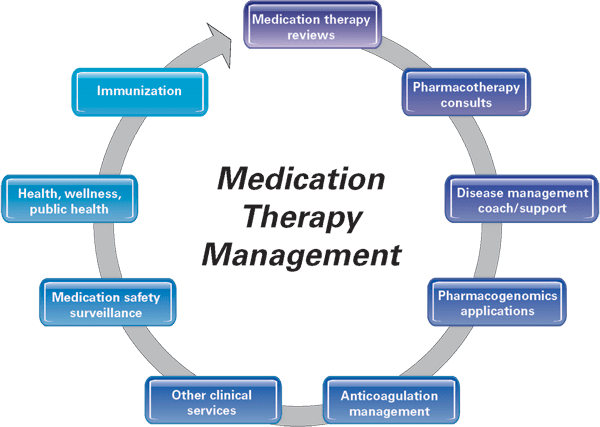 The explanation of clinical pharmacy brings up a new term that we need to define, medication therapy, also commonly called medication therapy management (MTM for short). The American Pharmacists Association defines MTM as a service or group of services that optimize therapeutic outcomes for individual patients (APhA). The purpose of MTM is to help patients get the best benefits from their medications by actively managing drug therapy and by identifying, preventing and resolving medication-related problems (APhA). Figure 1 shows the different services that fall under the MTM umbrella. The American Pharmacists Association. (2018). Medication Therapy Management. There are five key elements to the MTM service model. These include: medication therapy review, personal medication record, medication-related action plan, intervention and/or referral and documentation and follow up. Let’s break each of these down a bit further. Medication therapy review is a process that occurs between the patient and the pharmacist. The pharmacist gathers specific information on the patient and reviews the patient’s medications (both prescribed and non-prescribed medications as well as any supplements) to see if there are potential medication-related problems. Next, the pharmacist creates a list of the identified potential problems and creates a plan to solve those issues. A personal medication record is a full record of all the medications a patient may be taking. Again, this record includes all medications, whether they are prescribed or not, along with herbal products and supplements. This record is intended to be used by the patient and includes information such as known allergies, any medication-related problems, the names of all medications they are taking, what they are taking the medications for and instructions on how to properly take the medication. The medication-related action plan is for use by the patient to track their progress for self-management. Finishing the action plan is a co-effort between the patient and their pharmacist. It includes items that the patient can act on and does not include actions that require a physician’s or healthcare professional’s approval. The purpose of this tool is to encourage and empower the patient to participate in their overall therapy. During the intervention and referral process, the pharmacist addresses any medication-related problems that may have arisen. If it’s needed, the pharmacist will refer the patient to a physician or healthcare professional. For example, a patient may require being monitored for high-risk medications or may require disease management education to manage chronic diseases, like diabetes. Services are always documented, and follow-up visits are scheduled depending on the individual patient’s needs. Having the correct documentation serves several purposes, including: improving patient care and outcomes, enhancing continuity of care, complying with rules and regulations and protecting against potential professional liabilities. During the MTM process, pharmacists assess four major factors of each medication a patient is taking. The pharmacist will ensure all a patient’s medications are indicated, effective, safe and convenient. A medication is indicated if it is a medication that can be used to treat a particular disease state. For example, an inhaler like albuterol is indicated to treat shortness of breath from asthma or chronic obstructive pulmonary disease (COPD). Albuterol is not indicated to treat shortness of breath from other causes like smoking or allergies. If a pharmacist were to find that albuterol was being used to treat shortness of breath in a patient who smokes, but does not have asthma or COPD, that pharmacist would identify that the albuterol is not indicated and would recommend discontinuing the albuterol. This is because the albuterol would likely mask the shortness of breath from smoking, which may motivate a patient to quit smoking more if they did not have a quick-fix from the albuterol inhaler. Next, a pharmacist determines if a medication is effective. A medication is effective if it’s working to treat a patient’s disease. Let’s go back to the albuterol example. Is the albuterol inhaler decreasing the patient’s shortness of breath? If it is, then the albuterol is effective; if the shortness of breath is not improving, then the albuterol is not effective. After determining a medication is indicated and effective, a pharmacist would then determine if the medication is safe. They do this by assessing if a patient has any side effects or is at risk of having any side effects because of the medication. Back to our albuterol example, is the patient with the albuterol inhaler having their heart beat much faster when they use it? If so, the pharmacist can determine why that is happening and work to fix that issue. Is not forgetting to take the medication. The pharmacist will identify any compliance or convenience issues and work with the patient to resolve them. To revisit our albuterol example one last time, a pharmacist will make sure the patient is able to properly use the inhaler, so they can get the medication needed to treat their asthma or COPD. Pharmacists will use this process for every medication a patient is taking to identify any issues. They will then work with the physician and patient to resolve them which will ultimately help the patient better treat their disease. This process has been studied and has shown that patients who receive medication therapy management are more likely to take their medications, and in some cases have better control of their diseases. So, what is the wait all about at the pharmacy? The answer itself is quite simple, patient-centered care. Patient-centered care to ensure that the medications are safe and there aren’t drug interactions. Care to ensure that the medications are convenient for the patient. Care to be certain that the medication is going to be effective. At the end of the day, what matters isn’t that we get in and out of the pharmacy line as quickly as possible. It’s that our pharmacists have our best interests in mind and are doing their due diligence to ensure that we as the patients, are going to be alright.